County firefighters thought they were responding to a call about burning petroleum near Refugio State Beach when they were dispatched on reports of gas odors in the area. It was just after 11:42 a.m. on Tuesday morning when a 9-1-1 call first came into the Gaviota Fire Station, and the crew went out to find the culprit. 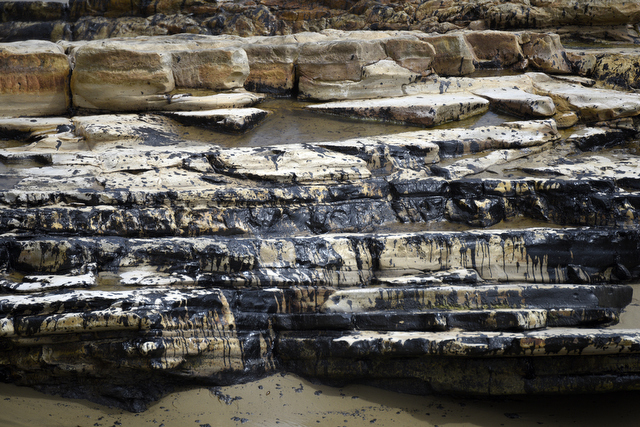 “That’s when they found a black slick of fresh crude oil; just wave after wave of it pouring onto the beach,” said Captain Dave Zaniboni, county fire department spokesperson. The slick in the ocean appeared to be quarter-mile long, 100 feet wide. The firefighters followed the trail up the coast and found oil pouring out of a culvert under the freeway, dumping onto the beach. They tracked down the source to a giant sinkhole on the other side of the freeway that divides the Gaviota hills from the shore. It turns out that first 9-1-1 call came in 12 minutes after a Plains All American Pipeline employee remotely shut down the line at 11:30 a.m. because “pressure anomalies” occurred that morning, according to Plains. The company, which is headquartered in Houston, operates the 24-inch, 10.6-mile pipeline. It’s unclear how much oil seeped out after 11:30 a.m. According to a federal order issued Thursday by the U.S. Department of Transportation requiring Plains to shut down immediately, the operator discovered the failure “around 1:30 p.m.” and reported the problem to the National Response Center at 2:56 p.m. The federal document confirms that a Plains employee “shut down and isolated the line” around 11:30 a.m. and called field personnel to investigate the matter. Five Plains employees work out of an office in the Santa Barbara area at ExxonMobil’s Las Flores Canyon Facility. They visually confirmed the spill at 1:30 p.m.
What exactly went wrong remains unclear. The company stated mechanical issues arose at the pipeline at 10:45 a.m. Tuesday morning. Plains stated that an operator restarted the pumps at the Sisquoc Station at 10:55 a.m., and at 11:15 a.m. those pumps “went down.” It’s unclear if that mishap with those pumps — which are located 60 miles north — was related to the spill. Reports indicate that Plains, which operates 17,800 miles of crude oil pipelines across the country, has had problems with corrosion in the past. The cause of the spill is still under investigation. County energy division director Kevin Drude said if corrosion is a problem in this pipeline, “that makes the entire stretch suspect.” The pipe goes up to Kern County, Drude explained. 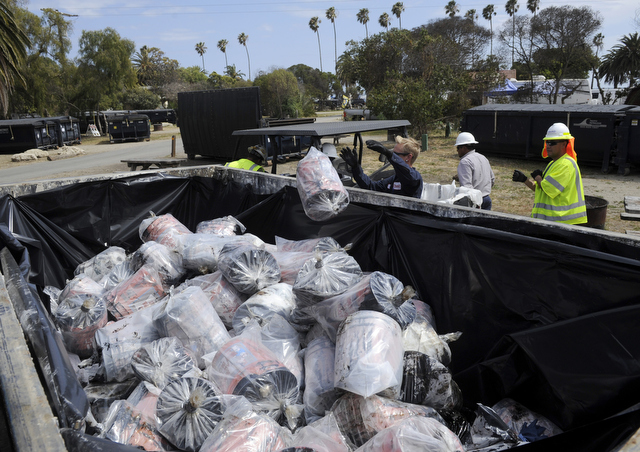 Plains conducts spill response drills in the Santa Barbara area each year, according to Plains spokesperson Tami Kelly, and safety trainings happen four times a year. Plains CEO Armstrong said at a press conference Wednesday that the pipe had been inspected recently, but the results from the inspection were not yet available. Inspections are required every five years. As of Friday morning, close to 10,000 gallons of oil had been cleaned up. “Cleanup doesn’t occur overnight,” said Jennifer Williams, incident commander and federal on-scene response coordinator. So far, a combined force of about 625 personnel, 17 vessels to remove oil, and two helicopters are involved. U.S. Coast Guard spokesperson Rob Simpson said on Wednesday that dispersants are not being used. Six brown pelicans and a juvenile sea lion have so far been rescued. Additional numbers about harmed creatures are not yet available. Goleta issued a state of emergency on Thursday to allow it to implement necessary measures, but no Goleta beaches have been closed. Refugio and El Capitan state beaches remain the only beaches closed. 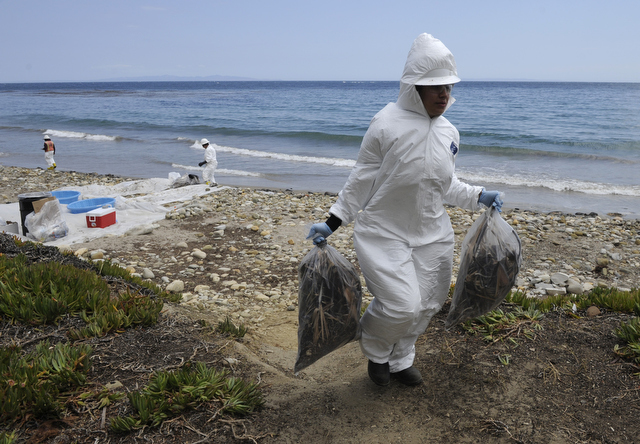 Goleta spokesperson Valerie Kushnerov stated there were additional tar balls at Haskell’s Beach in Goleta but she was unsure if those were related to the spill. “To me it looked like a typical day at Haskell’s Beach. But it’s a constantly changing situation,” she said.